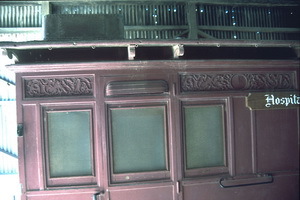 Side loading carriages built at South Australian Railways Adelaide Loco on an imported Cleminson six wheel underframe. First class side loading carriage built South Australian Railways Adelaide Loco seating 48 passengers. 3.1879 Entered service as first class car seating 48 passengers. 5.1880 Entered service as first class car seating 48 passengers. - Converted to second class. 2.1880 Entered service as first class car seating 48 passengers. Composite class side loading carriage built South Australian Railways Adelaide Loco seating 56 passengers. 3.1881 Entered service as composite class car seating 16 first and 40 second class passengers. - Converted to all first class. - Rebuilt as a Kitchen Car. 4.1881 Entered service as composite class car seating 16 first and 40 second class passengers. - Converted to all second class. 5.1881 Entered service as composite class car seating 16 first and 40 second class passengers. - Rebuilt as Hospital Car. Second class side loading carriage built South Australian Railways Adelaide Loco seating 60 passengers. 17.2.1882 Entered service as second class car seating 60 passengers. - Converted to all first class seating 48 passengers. 8.1882 Converted to all first class seating 48 passengers. 8.3.1882 Entered service as second class car seating 60 passengers. 3.11.1882 Entered service as first class car seating 48 passengers. 11.1910 Converted to all second class. 22.1.1914 Converted to a hospital car. - Converted to employees van for use on narrow gauge Wilmington line. 8.11.1882 Entered service as first class car seating 48 passengers. 1.12.1882 Entered service as first class car seating 48 passengers.